The discovery of a small but distant galaxy 12.8 billion light years from Earth is providing important clues about the earliest years of the universe's life. By measuring the age of the galaxy's stars using gravitational lensing, astronomers in Europe and the US say the galaxy began to shine when the universe was just 150–300 million years old, which hints that these galaxies were responsible for dispersing the atomic fog that shrouded the early cosmos, during a period in the history of the universe that astronomers refer to as the "dark age." After the Big Bang, 13.7 billion years ago, the universe was hot and ionized. But as the universe expanded, it cooled, and 380,000 years after the Big Bang, protons joined electrons to make neutral hydrogen atoms, which block light. As stars and galaxies evolved whose radiation ionized the universe anew, allowing light to speed through space unimpeded – a period dubbed the epoch of reionization. Astronomers' knowledge of this ancient era is very limited because the light from galaxies that existed then has traveled for almost 13 billions years and is therefore extremely faint when it reaches Earth. But a new study by Johan Richard of the University of Lyon in France and his colleagues have spotted a ancient, distant galaxy that appears much brighter, due to gravitational lensing. "What makes this object very special is that we can really get a very strong signal on a very faint object," says Richard. When light from very distant bodies passes through the gravitational field of much nearer massive objects, it bends in an effect known as "gravitational lensing." In a pioneering technique, a Caltech-led group used massive clusters of galaxies—the best example of natural gravitational lenses—in a series of campaigns to locate progressively more distant systems that would not be detected in normal surveys. 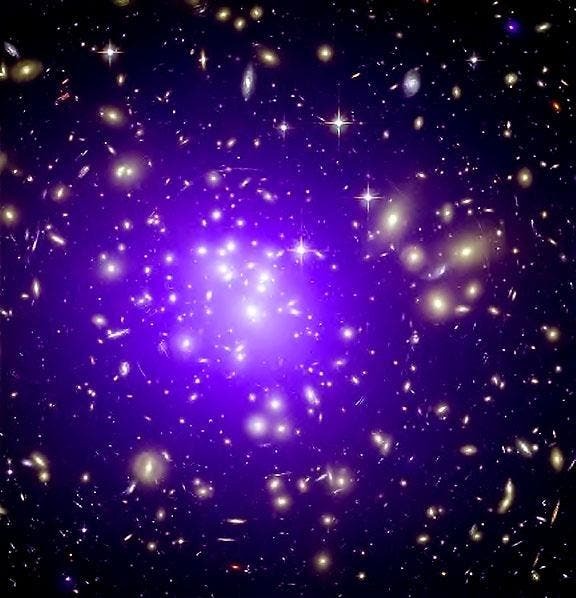 The galaxy is located far behind a galaxy cluster (image above) in the constellation Eridanus named Abell 383. The cluster's gravity splits the distant galaxy's light into three images and boosts its brightness by a factor of eleven, making it possible to study and analyze. Using optical and infrared data from two NASA observatories, the Hubble Space Telescope and the Spitzer Space Telescope, Richard's team found galaxy's redshift is 6.027, which means it is so distant the universe was only 950 million years old. The universe's expansion however stretches the galaxy's light waves by 602.7% as they travel to Earth, making it visible with most of its ultraviolet light appearing to us at infrared wavelengths. The galaxy looks so bright, the astronomers easily determined the age of its stars: most are older than 640 million years old. "That means that the galaxy formed these old stars very early – like only a couple of hundred million years after the Big Bang," says Richard. His team estimates that the galaxy's stars began shining between redshift 14 and 22, when the universe was just 150–300 million years old. For comparison, last October astronomers reported the farthest known galaxy, at redshift 8.6, but that redshift is uncertain. "Because of the magnification, the data is of excellent quality," Ellis says, noting that earlier claims of old stars in distant galaxies were unconfirmed. "It gives strength to the fact that there are old galaxies at redshift 6, and that means that these galaxies have been around for a long time. The implication is that there are many galaxies out there waiting to be discovered that are at redshifts of 10 and beyond." The Hubble Space and James Webb telescopes may find them, he says, with yet deeper exposures. The newly discovered galaxy is small, measuring only a few thousand light-years across, compared with the Milky Way's diameter of 120,000 light years. Yet this ancient object spawning stars as fast as the Milky Way. Richard and his colleagues estimate that the mass of the galaxy's stars is 6 billion times that of the Sun, far smaller than the Milky Way, whose stars weigh in at about a hundred billion solar masses. "That's why we're using gravitational lensing to look for fainter objects, because if they're very numerous, then they would have reionized the intergalactic medium," says Richard. Richard and his colleagues have submitted their work to Monthly Notices of the Royal Astronomical Society Letters; a preprint is available on arXiv.